Basketball fans in South Cotabato particularly in the town of Polomolok are in for a treat next month as former PBA players like Alvin Patrimonio, Johnny Abarrientos, Bal David, Nelson Asaytono, Marlou Aquino, Benjie Paras and Atoy Co head several former basketball greats in a "Basketball for a Cause" at Polomolok Gymnasium this coming April 13, 2014. Also joining them in this benefit event by Koronadal Lodge No. 209 Brethren Association, Inc are Zaldy Realubit, Bong Ravena, Rodney Santos, Gerry Esplana, Bong Alvarez, Bonel Balingit and our very own Kenneth "Captain Marbel" Duremdes. The event is also in partnership with Philippine Red Cross- South Cotabato Chapter and LGU- Polomolok. Check out the event poster below. 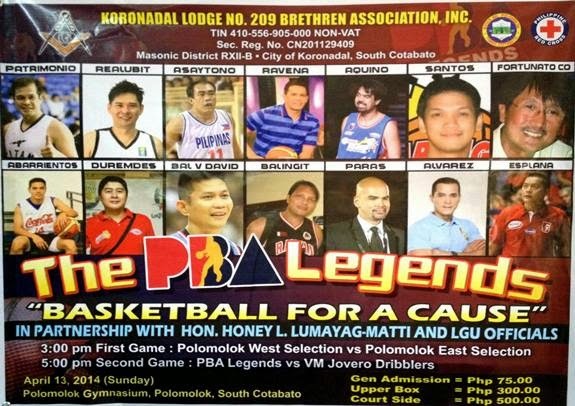 PBA Legends in Polomolok. Photo from Batang Polomolok Facebook page.